Oscar Wilde once wrote, “I summed up all systems in a phrase and all existences in an epigram.” A bold claim to make, some may argue, yet when one dips into the magical kingdom of Wilde’s writings, what is impossible not to notice is how “right” he often is. Words for Wilde, were like pearls, to be played with, sparkling in their wit and pregnant with meaning in their durability. Perhaps this is the most distinguishing facet of Wilde’s oeuvre – the manner in which it has lasted and will continue to endure, seemingly ageless in its appeal to each new generation. A large part of Wilde the legend is due to the fact that he had a more than eventful personal life: he defied traditional Victorian conventions, dared others to follow him, and bestrode the world like the “flamboyant high priest of aestheticism” he professed himself to be. Yet he also wrote in a variety of genres, dazzling his peers and astonishing his audiences with his fierce intellect, playful paradox and sheer love for the English language. Wilde’s love of language for language’s sake shines through in this collection. Arranged in four chapters: Ironies & Paradoxes, A Duel Between the Sexes, Art for Art’s Sake & Beyond and The Artist as Philosopher, this is a compendium to treasure and chew upon, morsels of wisdom that provoke, entertain and enlighten in equal measure. Some of Wilde’s more famous sayings have entered the lexicon of the English language; there are several here which make you think, “nothing can cure the soul but the senses, just as nothing can cure the senses but the soul” and “women love us for our defects. If we have enough of them they forgive us everything, even our intellects” – to highlight just a couple. Whether it is poking fun at class, subverting gender stereotypes, mocking man’s vanities or exploring the sheer mystery of life, Wilde always proffers a gem, which makes us think afresh. Once you have imbibed or perhaps devoured this exquisite potpourri of a book, you will want more. Get your hands on anything he wrote – plays, essays, poems, letters, novel, and children’s stories. He is one of the greatest writers who ever lived, constantly enchanting and forever illuminating. 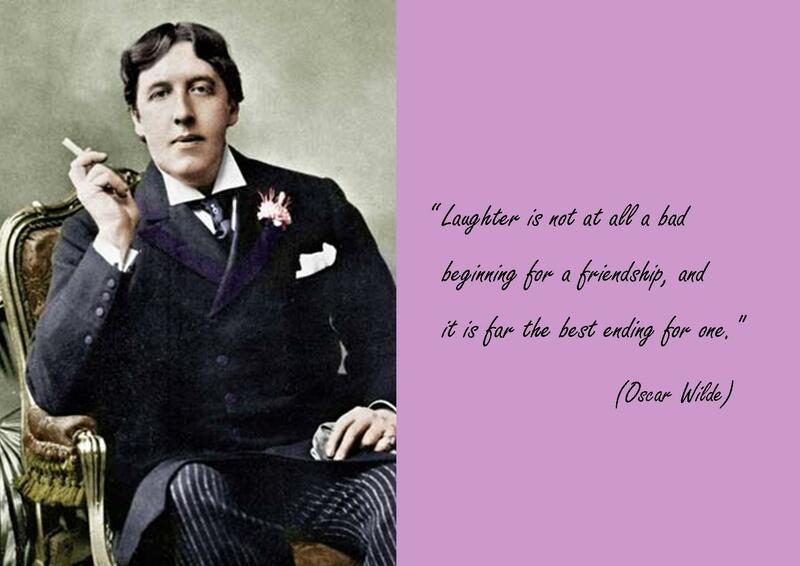 Wilde was not only blessed with that most precious of qualities – kindness – but also a piercing insight, who, through his sundry characters and essays, understood acutely the wellsprings from which laughter and unhappiness, joy and misery, altruism and selfishness sprang. He really did put genius into his work and not just his talent.